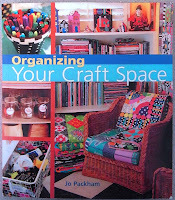 If you like looking at how well-known crafters organise their craft spaces, then this book is worth checking out. It's broken down into sections covering paper crafts, quilting, needlework, beading and stained glass work and it also has a section offering organising tips for your own crafting area using your own craft style. It's an easy read and has loads of great photographs showing each of these ladies unique styles and ideas. I've read it once but it's the kind of book that you'll want to refer back to again later - it is really inspiring if you're looking for organising tips.